Many people trained within NKT might be full of fear and guilt to either leave NKT or after they have left NKT already. These feelings of guilt and fear might undermine the clarity to make a firm and strong decision and to rejoice into a virtuous deed. Since the NKT offer only a selection of the vast basket of Buddhist teachings within the Tibetan Buddhist tradition, it might be helpful for NKT affiliated persons to learn those teachings not given in NKT—especially about the teacher-student-relationship. Recently a nun pointed out teachings from the Kalachakra Tantra which say that a wise disciple would abandon wrong gurus as they would abandon hell. I will give the quote—and a link to a file with other quotes from Buddhist scriptures—below. These approaches can be for support in some form (for example with donations, fund-raising events, visa applications, hosting, transport, publicity, social events); or offers to give teachings, empowerments or informal talks, or to perform pujas, ceremonies, ritual demonstrations and so on. as they would abandon hell. People with such faults are not fit to be relied upon as gurus in the Vajra Vehicle. Even if one takes such a person as a guru and requests initiations and so forth, there can be no meaningful receiving of the initiation. Moreover one will become infected by a measure of his faults and fall from all elevated status in this and future lives. Most of the above verse is easy to Understand. “Without knowledge” means to be without the essential teachings on the six-branched yoga, for example. “Working to deceive his disciple” means to delude disciples by telling lies. “A mind that has fallen from the great bliss, without initiation” means that without having received the initiation he is bestowing, he nevertheless teaches it to others. “Filled with carnal desire” means working only for the pleasure gained from the sexual union of the two organs. Disciples who wish to gain worldly and nonworldly powers by way of mantra should first devote themselves to a guru. Furthermore one should examine the vajra master thoroughly. One should thoroughly examine his words. Otherwise, relying upon a guru unexamined, the disciples’ dharma will be perverse, and perverse dharma will send them to hell. has said that very wished-for siddhi follows the master. they will not accrue even the tiniest of faults. In mantra, even though one has taken as a guru a person with the faults of pride and so forth, wise disciples, meaning those of intelligence, will abandon him as a cause of complete enlightenment as they would abandon hell. Because of these words, even though he has been taken as a guru, if he does these wrong deeds, disciples who strive for freedom should leave him. the intelligent disciple will not take such a one as guru. Once that is used as a reason and one casts off the undertaking of holding him as a guru and as a field of reverence, one opens up the opportunity for a root downfall to occur. One must learn, therefore, to distinguish what is to be developed from what is to be discarded. Some explain the two instances of the phrase “taken as a guru” in the two Great Commentary passages above as applying to gurus taken by others. It is interesting to note that the mentality Chopel here criticised ws that of sectarian fundamentalists in Tibet, in prticular those followers of Pabongka who were running riot at the time, attemting to violently subdue the red hat sects while claiming to be ‘possessed’ by Shugden. Lo and behold, the same mentality he alludes to is characterised by this latest edict from probably the most political of oall contemporary Buddhist movements with Tibetan roots, the New Kadampa Tradition-seingly, only they know ‘the truth’ and all others have become polluted by politics. So screaming slogans of hatred, calling others liars and engaging in placard holding demonstrations is not political activity. I guess it must just be the new face of ‘pure’ religion. How lost these people are and how sad that they dupe so many. actually, the NKT letter is a good summery of what NKT’s fundamental believes are. We take refuge in Geshe-la, his books. his centres and his followers. Amen. The basic idea of a claimed fundamental ‘purity’ of the NKT ‘lineage’ is a bit like the claim of the Nazis of a supposed purity of the Aryan’s race. Subsequently the Nazis forbade the Germans to have relations with the Jews because this would mix the ‘pure’ German/Aryan blood with that of the Jews. Like this idea is completely crazy because humans are humans no matter what supposed race they are, similarly the idea of ‘pure Dharma’ is also crazy because Dharma is Dharma and there has never been a teaching that there exists ‘impure Dharma’–the opposite of the ‘pure Dharma’. There is Dharma and there is non-Dharma. What NKT is doing is to claim to have a better, a more pure Dharma. The basis of this assumption is not based on reality because NKT derive this ‘special purity’ from the claim to have preserved ‘purely’ the ‘special lineage’ of Je Tsongkhapa (which could be portrayed as a mix of different schools + his own thoughts/realizations). Actual NKT have only a fraction of Je Tsongkhapa’s teachings (and often it is presented in a distorted manner). So where is the purity here? The claimed purity is just propaganda or an unverified (blind) belief. Actually, I think, the claim of ‘purity’ is based on a sense of self-importance and/or superiority. Because one is so important and special everything related to oneself must be very special, very unique and very pure too. I think, this is the pattern of thinking like the believes of a racist, who thinks the own race and the own culture/religion is is better than others. While NKT does not openly claim, to be better than others, the repeated emphasize of the own purity (of lineage, practice, and practitioners), combined with the infusion of fear to destroy that claimed purity by ‘mixing it’ with other Dharma teachings (‘traditions’), together with the repeated belittlement of other (Tibatan) Buddhists as impure (this is what ‘mixing Dharma with politics’ actual means in the NKT context: impure person, impure practice = evil sinners), will lead to the result that NKT followers are utter entangled into NKT and will finally have no connection any more to other Buddhists. 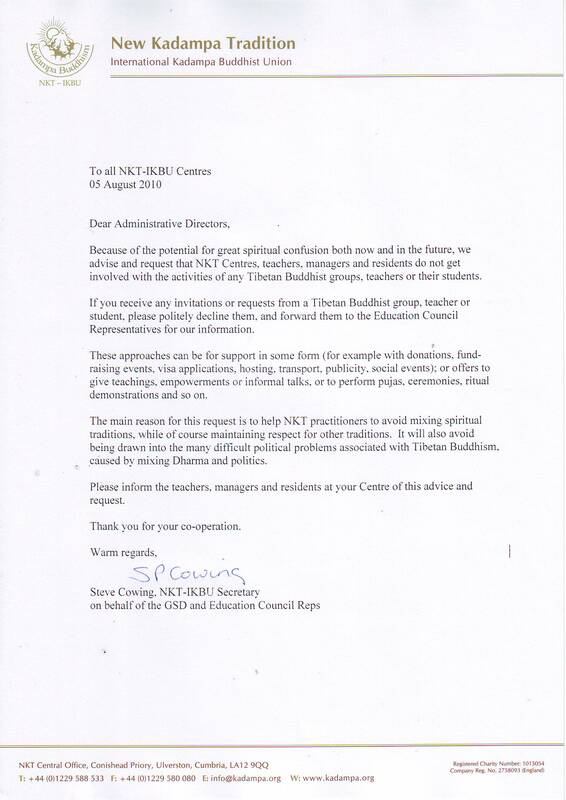 Though NKT leadership claimed in the past wrongly every NKT follower could go to other Buddhist teachers and masters, finally they state openly, what they really think: NKT followers should stay purely in NKT and have no contact with other Buddhists. I fear most NKT followers believe this type of skilful NKT propaganda. The disconnection from genuine Buddhist masters and traditions will further increase the power of the self-circling, self-referencing beliefsystem Kelsang Gyatso set up for Westerners, which holds them tightly like a spell. Make a link to my blog on your blog fist. I have accepted enough links to all of your blogs and multiple websites. Do not abuse my blog as your spam link machine. Try to remember what fairness is.